Sometime when I was a teenager, my step-dad gave me a box full of sci-fi and war novels. I'm not sure where he got them -- maybe in bulk at a garage sale or something. Years later, many of them are still sitting on a shelf, mostly unread. I thought I'd give one of them a shot, and found a writer's vision of the year 2050 -- written from 1938 -- as more interesting than the story itself. The book I chose somewhat randomly (but also because it was written around the time my parents were born and had the copyright renewed the very year I was born) is The Impossible World by Eando Binder. I learned later that Eando is a pen name for two brothers, Earl and Otto Binder, and that Otto went on to write for Captain Marvel and Superman comics. 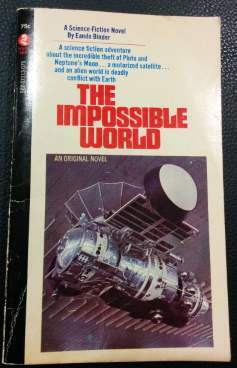 The cover blurb for The Impossible World says, "A science fiction adventure about the incredible theft of Pluto and Neptune's Moon... a motorized satellite... and an alien world in deadly conflict with Earth"
So how did the author do in predicting a world now just 32 years in our future? Propulsion will use rocket engines. New moons will be discovered around the planets in the solar system. Plastics can be a major manufacturing material. Perhaps the most ironic is that the story (as indicated by the blurb) identifies Pluto as "a definite planet", but says that it disappears, just as the 2006 reclassification of Pluto made it "disappear" as the 9th planet in the solar system. These were a few of the things that struck me as clunkers -- but hey, maybe things will change in the next three decades. Life, including evolved species, is abundant in the solar system. All of the planets and many of the moons in the solar system can sustain human life with only a chemically assisted adaptation period, and some without requiring even that. Although the lack of gravity on a spaceship is acknowledged, it is as if the author(s) didn't really understand what that would be like. Virtually everything is described as if gravity were present. Characters do complex math and communications encryption by hand. The story prizes confidence, action and determination (to the point of foolhardy "Nothing could possibly go wrong...") and everything is done with a fair bit of melodrama. The villain is a villain because his interests oppose those of the protagonist and his people. Otherwise, he's quite helpful in explaining every detail of what is going on in his constant monologuing. Science (sometimes even referred to as "super-science"!) is paramount, and the young scientist protagonist is somehow entrusted with planning military action with all of Earth's forces as well as negotiating the fate of planets, "For [the Earth's governing council] knew that in this stupendous crisis everything depended upon the soundness of the reasoning of a keen-minded young scientist; far out in space." Overall I wouldn't rate it as great literature, but The Impossible World did send me time-traveling -- just into the past rather than the future.